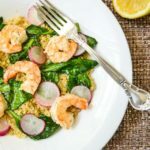 This quick and easy shrimp and quinoa bowl is the perfect weeknight meal! Loaded with protein and nutrients on the table in 30 minutes! Combine lemon through pepper in shallow dish. Marinate shrimp in mixture for 10 minutes in refrigerator. Add shrimp to pan after vegetables are cooked. Cook shrimp approximately 2 minutes on each side or until shrimp are pink. Heat oil in medium saucepan over medium heat. Saute garlic in oil for one minute until golden brown being careful not to burn the garlic. Add quinoa to pan and stir for two minutes. Add water to pan and stir to combine. Cover and turn heat to low to cook for ~12-15 minutes until all liquid is absorbed. Remove from heat. Squeeze lemon juice into quinoa, stir to combine and set aside. Heat ghee in large pan until liquified. Toss radishes with ghee and saute for 4-5 minutes or until radishes are al dente. Add spinach, salt and pepper; tossing to combine with radish mixture. Cook until spinach is just barely wilted. Remove vegetables from heat and reserve in a bowl. Plate quinoa, vegetables and shrimp and garnish with lemon wedge. Squeeze lemon wedges to taste and enjoy!